Japan's Broken Economy-----25 Years Of Failed "Stimulus"
So thoroughly destroyed is Japan’s economy that some of the numbers it produces are beyond comprehension, just staggering in any meaningful context. 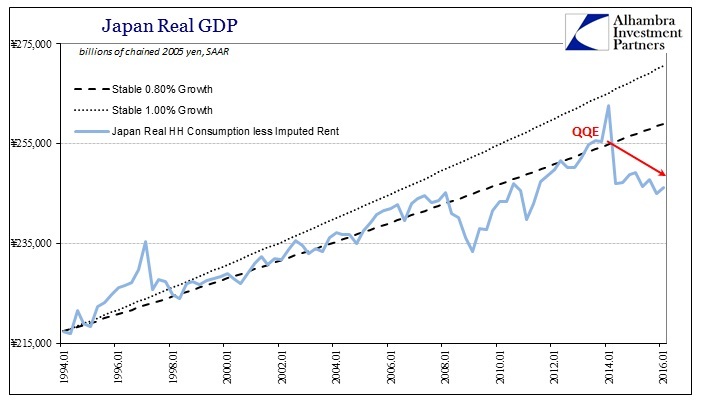 For example, Japan’s real GDP (SAAR) for Q1 2016 was ¥530 trillion (chained 2005). That compared to ¥447 trillion in Q1 1994. Over two decades and two additional years the Japanese economy has grown by a grand total of 18.5%. On straight arithmetic alone it doesn’t work out to 1% per year let alone on a compounded basis. Since the first quarter of 2001, meaning fifteen years, real GDP “advanced” 10.4% total. Clearly the Japanese economy as bad as it was has slowed from even that revolting baseline. We don’t have to venture far or try too hard to guess when this new “slowing” occurred: since the first quarter of 2008, Japanese GDP thanks to Q1’s positive number is now the slightest amount more than eight years ago (¥530.01 trillion now vs. ¥529.63 trillion, or +0.1%). As everywhere else around the world, the Great Recession was not only a global event, it “somehow” broke the global economy in chillingly uniform fashion. There is something quite sinister contained within this review, particularly since I haven’t presented the Japanese economy much of any baseline at all. It is fashionable especially of late to believe this is all some trick of slowing demographics and therefore all “stimulus” is to some degree helpless in the face of Japan’s determined self-extinction. There is some truth to the charge, which is the same of any good lie, but it doesn’t amount to a 1% baseline. Capitalism is not strictly population; in fact, that is the true hidden genius and value of capitalism as it creates productive, sustained societal gain well above any demographic shifts. At 1% and less over nearly a quarter century we can safely assume there has been no capitalism practiced in Japan during that time. For sake of further (and more damning) argument, let’s just assume that the aging population is actually to blame for Japan’s 1% unevenness. That still leaves the final slowing, the right hand side of the chart above where even 1% is now a dream and a seemingly unattainable goal. Retirement and aging didn’t suddenly amplify in 2008 and 2009. Given the history of intervention and “stimulus”, and more so when it occurs and really re-occurs, any impartial observer would be forgiven if they believed that QE’s were actually constant impediments to growth (a negative multiplier in the parlance of the orthodoxy). The proliferation of “stimulus” after the GR correlates only with this downshift in the Japanese economy that cannot be due to demographics. At best, QE’s have accomplished nothing at all positive, leaving no trace of something actually being stimulated for all the sustained “stimulus”; at worst, QE is the cause of Japan’s further nightmarish descent. There is an easy case to be made against quantitative easing – starting with the distinct inability of the Bank of Japan (or any central bank inflicting it upon whatever economic system) to get the quantity “right.” If it is supposed to be a precisely-determined amount of precisely-measured “stimulus” then having to do it over and over and over invalidates at least the “Q” if not the “E” too. 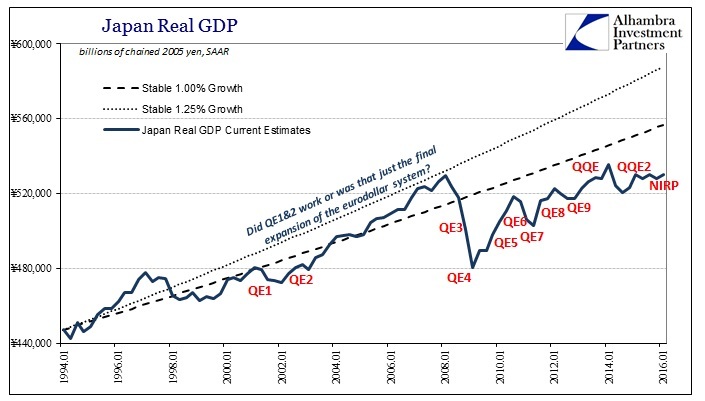 In Japan, the damage from QE is a little easier to observe than in other places, but as anywhere else it is households/consumers that bear the brunt of these unfortunate distortions that amount to little other than PR stunts (no matter how poorly QE’s perform, the media dutifully and reflexively continues to call it all “stimulus”). Household spending in Japan has underperformed even overall GDP during these lost decades – not even managing steady 1%. After the rift in 2008 and 2009, HH’s further underperformed like overall GDP though had managed to get close to the pre-crisis trajectory. 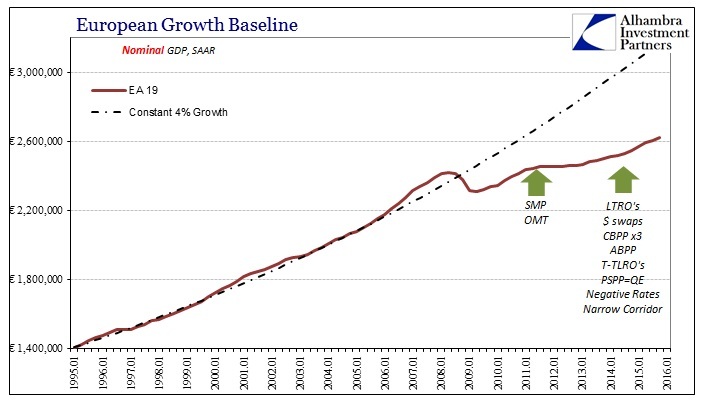 That was before QQE devastated even that likeness of recovery. Monetarists have claimed that somebody has to lose in these kinds of redistribution schemes, and the elevated quantity of QQE makes clear who that was. These losers are only supposed to be on the short end for a short while until the stimulated recovery brings the economy roaring back so that they are paid in full for their forced “contributions.” Yet, as is clear of overall GDP, QQE, as the numerous QE’s before it, has been all cost with no recovery at all; in fact, as noted above, the Japanese economy is worse off now than it was before. The massive scale of QQE intrusion and the violent, negative reaction to it in household spending shows the true nature of all QE no longer entangled in other economic factors; the purest distillation of cause and effect. What we find, then, of Japan is the combination of factors that are evident almost everywhere else around the world post-Great Recession. Monetary “stimulus” is asking consumers and households to bear the burdens of that “stimulus” in order that the full recovery will take place – except as we find elsewhere, the post-GR environment has already proven that the recovery will never take place. Central banks are thus placing greater burdens upon their people for an outcome that simply can’t happen. I think that easily amounts to “stimulus” that adds only more negative factors to a global economy with already a huge burden. The reason for it is straight forward owing to a fallacy about the GR itself. It was never a cyclical event, nor was it the cause of this split in the economy – all economies for that matter. The Great Recession was instead a revelation of the true global economic state that existed for a long time before it. 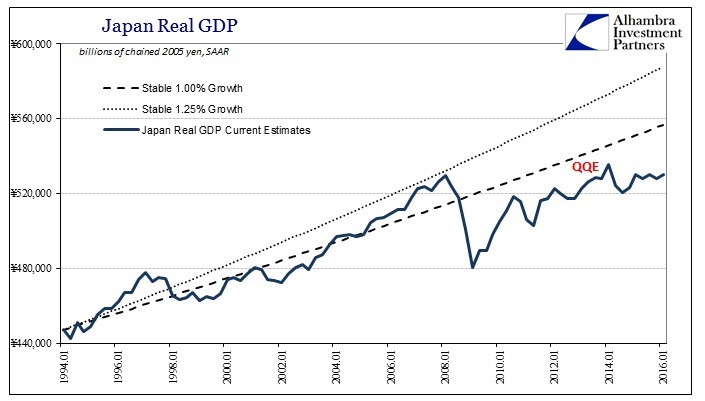 Growth and prosperity, even in Japan where GDP actually accelerated for the briefest of moments near to the 1.25% “upper bound” (a very sad commentary on Japan where just 0.25% more in GDP compounding amounts to a different world entirely) was never more than a temporary illusion. 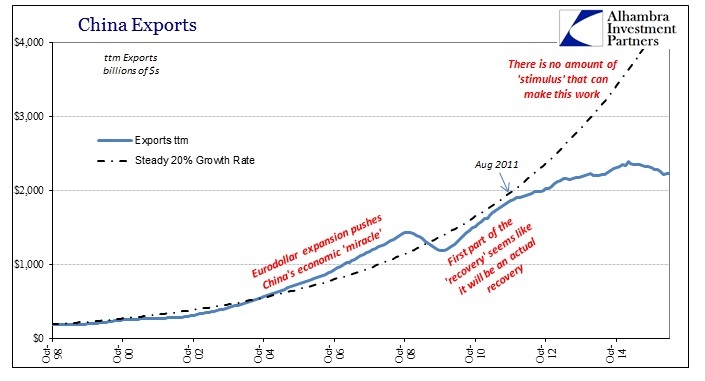 All the world’s “stimulus” has not been able to budge it since the paper economy of the precrisis evaporated into the credit default swaps of AIG, and the collateral shortage that never has replaced the uniformity of MBS repo; like Humpty Dumpty, all Bernanke’s horses and all Kuroda’s men haven’t been able to put together the one unifying factor from Japan to the United States, from Europe to China. 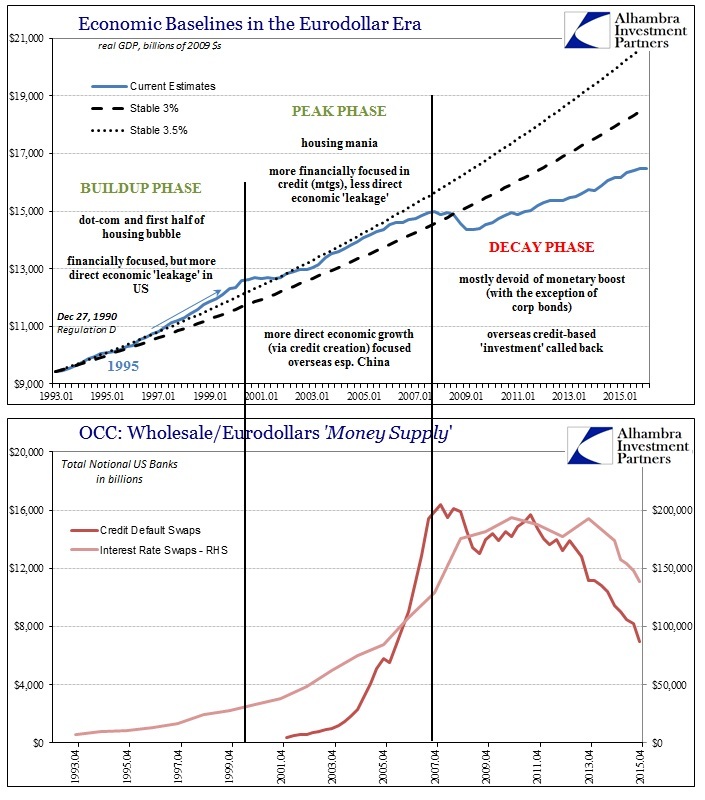 It’s as if there was something else all along that took every monetarism that every central bank offered anywhere it was offered and swallowed it whole without leaving the slightest economic trace, only further and further slowing. What can possibly be bigger than all the world’s QE’s and “stimulus” combined?